Epoxy compounds supplied by M.G. Chemicals are protective thick film encapsulating and potting coatings applied greater than 250um in thickness. 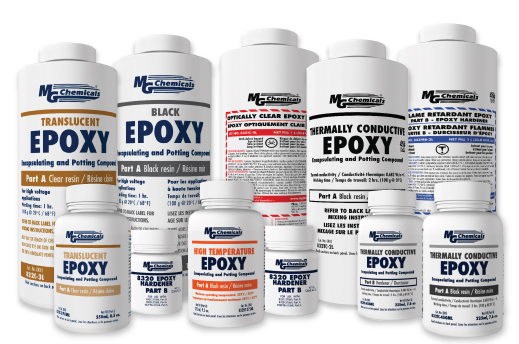 The range of applications for the epoxies includes protection of sensitive electronic components from impact, shock, vibration, heat, conductivity, moisture, and chemicals. Some products are pigmented to hide the circuitry and others are translucent to allow visual inspection. Also included in the range are flame retardant materials qualified to UL, thermally conductively epoxies designed to release heat from a circuit board and a high temperature compound that ensures products can be protected where temperature is critical. Protects sensitive electronic components from impact, shock, vibration, heat, conductivity, moisture, chemicals, and visual inspection. Protects sensitive electronic components from impact, shock, vibration, heat, conductivity, moisture, chemicals. Allows visual inspection. Optically clear epoxy that can be cured with or without heating. It is tough, water and chemical resistant, an electrical insulator, and has excellent machining properties. For encapsulating and potting electronics in high temperature environments, aggressive chemical environments, or where improved technology protection is desired. Provides insulation and protects sensitive components and circuits from: static discharge, impact, heat, shock, conductivity, abuse, vibration, moisture, fresh and salt water, chemicals and analysis. The 834FRB Flame retardant epoxy encapsulating and potting compound is a UL 94V-0 recognized electric grade epoxy in the QMFZ2 category. This two part self-extinguishing epoxy provides a black finish with great insulation and protection value.